Pavement markers are designed to keep motorists safe. By illuminating the road at night and during rainstorms, these small reflectors help control traffic and create safer driving conditions. But, when these devices come loose, they can create road hazards. Several recent incidents involved loose markers hurtling into vehicles and even flying through windshields. That’s why it’s imperative that the adhesive securely affixes the markers to the pavement. In 2003, Texas Department of Transportation (TxDOT) wanted to find a new adhesive, because the one being used at that time was failing. The adhesive was also constantly plugging the application hoses. This was a serious problem that interrupted operations and required trips back to the service center, resulting in several hours of downtime on each occurrence. 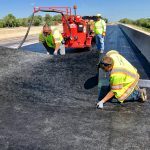 TxDOT decided to do two test applications of Hot-Applied Flexible Pavement MarkerAdhesive™ by Crafco. This thermoplastic bituminous material is easy-to-use and very flexible,with high adhesive capability. When properly used and applied, it bonds markers and reflectors to both asphalt and concrete pavement surfaces. The single component material is easily melted and poured or pumped onto pavement surfaces. Since it is a hot melt composition, it sets upon cooling and is ready for traffic in less than five minutes. Formulated with premium asphalt, polymers and additives, this unique material holds markers in place and remains flexible at temperatures down to 20°F (-7°C). One test application took place on the Northbound lane of US 67, Northeast of San Angelo, on December 2, 2003. 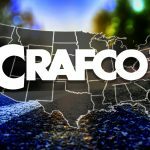 25 markers were applied by Crafco, Inc. and Crafco Texas workers. The application was attended by personnel from TxDOT San Angelo district. The other test location was on Texas Loop 6 at Bryan TX. It was attended by personnel from TxDOT Bryan District and area offices, as well as TxDOT Austin labs. 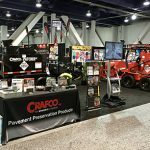 The application company used a Crafco Texas trailer modified with a Crafco BAX 250™ heating and application system. of four ounces each for high production. The digitally-controlled BAX 250 features a flexible heated hose with a handheld wand. A 75,000 BTU/HR propane burner supplies the heat to the welded steel tank. The BAX 250 is skid mounted for versatility.